This page is a collection of highlights from the history of the Palos Verdes Peninsula Unified School District. Do you have something to add? Please let us know! Enjoy this article from 2015 by The Daily Breeze’s Sam Gnerre, from his blog South Bay History. The following few items come from a leather-bound scrapbook at Malaga Cove (now the central District Offices). It includes articles and photographs dating between 1925 and 1926. Petitions have been filed with the County Superintendent of Schools showing that 23 children between 5 and 17 years of age now reside in Palos Verdes Estates or on the Palos Verdes Ranch, and requesting permission to withdraw this area from the Los Angeles City School District and form our own school district, with a separate elementary school board. This action was only taken after several friendly conferences with the Los Angeles city School Board, members of which, with Superintendent Mrs. Doracy, visited the property in October and were the guests at La Venta of the officials of he Homes Associations. 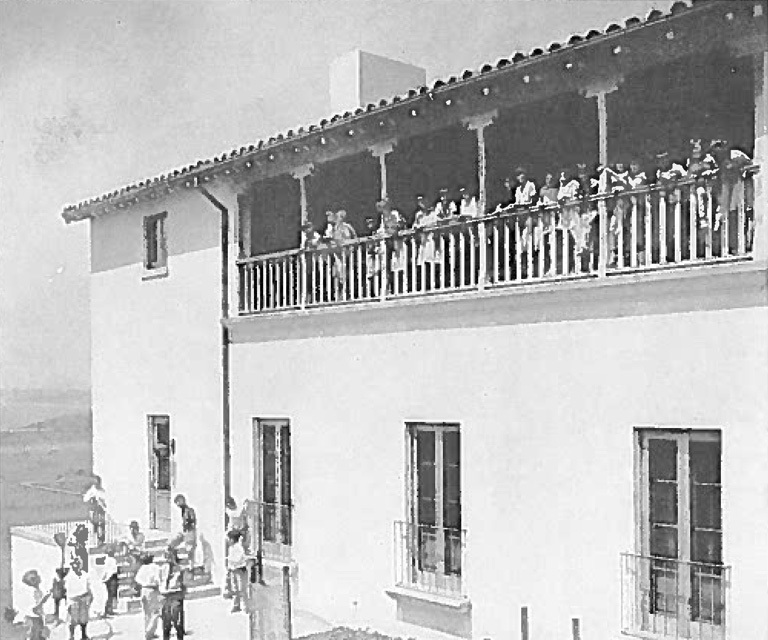 They finally agreed that Palos Verdes people could probably, with the aid of the management of the Project, do more for themselves in the way of building new buildings, providing playgrounds and arranging schools and recreation in keeping with the layout of the Project, than could be done by the Los Angeles School Board, and agreed not to oppose withdrawal of this area for the formation of a separate district. The matter now has to be approved by state and county authorities and it is expected that these formalities can be gone through with and successfully consummated by Feb. 1st, 1925, at which time a school Board for Palos Verdes would be elected. Immediately following the organization of this Board, it is expected that sufficient bonds can be voted to build a substantial school building on the 7 acres reserved for school and playground purposes at Malaga Cove. This building could then be made ready for occupancy next fall. During the following year it is expected that schools will be built at Valmonte and Lundada Bay where adequate sites and playgrounds have been reserved. Meantime, a school bus maintained by Palos Verdes Homes Association is collecting the children now resident on the Estates for attendance at the grammar and high schools in Redondo Beach, returning them home after school. The new Palos Verdes school building is now complete and will be occupied by the school classes some time before April 1st, according to announcement of the Board of Education. The cost of building and equipment have come slightly within the $85,000 bonds voted unanimously by the people of the district some eight months ago, and a great dedication celebration is planned by the Homes Association and School Board, with the cooperation of the new Women’s Club, to take place between April 1st and 15th. The building is an attractive concrete plaster finished and tile roof structure, designed by Allison and Allison, Architects, with a tower which will eventually have a large clock. There are at present three standards size class rooms, auditorium seating 294 people, with large stage and two dressing rooms, principal’s office, teachers’ rest room, community kitchen, toilet rooms and heating plant. 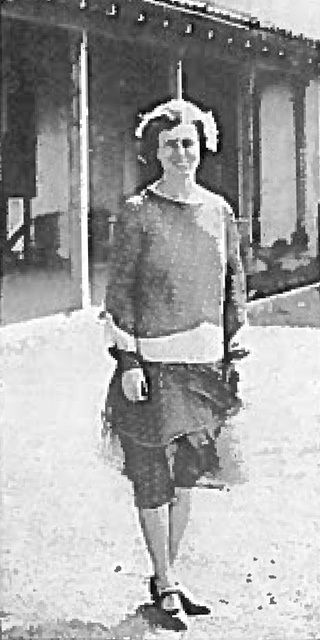 Miss Edith Perry, who has been principal of the temporary school in the Gardner Building at Malaga Cove Plaza, will have charge of the staff in the new building, aided by two additional teachers, Miss Mildred Hiliard and Miss Edna Spring. The furniture for the classrooms is all of the new movable type (not fastened to the floor) and will be arranged to get away from the rigidity of the old time class rooms, according to Mrs. Farnham B. Martin, Secretary of the Board of Education. Each child in the primary department will have its own table, painted gaily in some cheerful color. Work on the 7-acre playground has been progressing and should be ready shortly Miss Perry has received an inquiry from the County Director of Physical Education as to whether the County field day or Detention, which 44 county schools and 300 children would participate, could be held here in May, but the School Board doubts whether the playground will be finished in time. The finished grading for the ball field, tennis courts, and play areas for small children was practically complete when the recent rains set in and surfacing will be put on as soon as the ground is dry enough. When we who are now in the middle of things are laid aside to live a life of reminiscence, we’ll tell our grandchildren about Palos Verdes’ first school—and Miss Edith Perry. 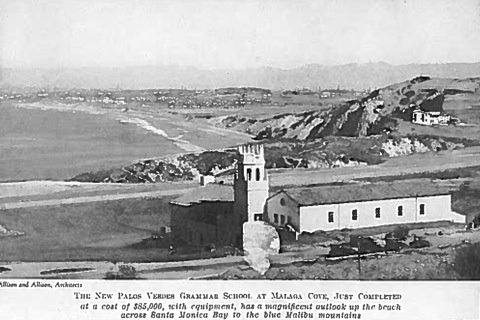 How she took a handful of children in the fall of 1925, and because the fine new Malaga Cove School was not finished, started them on the road to knowledge in a vacant room in the Gardner Building. We’ll remember the happy days a few months later when the entire school, from Principal down to the tiniest pupil, moved bag and baggage into the splendid new school. And we’ll tell them—our grandchildren—that there have been few better schools, or teachers, anywhere else! Miss Perry is a native of Indiana and was educated at Indiana and Purdue. Being by nature generous and painstaking, she has practically acted as individual tutor to each child in her class, giving many extra hours of her own time for the pure love of it. And the children all agree that the school is worth going to when Miss Perry is teacher.